This BAND Really Rocks! Our thirsty and thrifty, plush not scratchy, 100% super-sorbing soft terry cotton snap-on sweatband really soaks the competition! Terry Toppers Snap-On Sweatband absorbs without needing to be washed first. Some competitive snap-on sweatband brands need to be washed before they can absorb. Why bother workers with washing before wearing? Save up to 25% or more versus well-known competitive brands. Easy snap-on application. 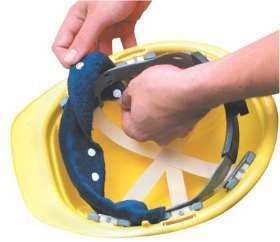 Helps headgear fit more securely. No foam middle. One size. Machine washable. Available in navy and beige.